On August 12th, the greatest sprinter of all time hung up his running shoes. As announced, the legendary Usain Bolt finished his career after taking part in the World Athletics Championships in London for the last time. He began his career in his native land of Jamaica when he was twelve and chose athletics over cricket, which he had played until then. During his career, he has become a legend: 11 World Championship titles and 8 Olympic medals, not to mention world records for the 100 metres, 200 metres and 4 x 100 metres! Usain Bolt has definitively earned his place in the pantheon of athletics. Only eight of the first of these models, named the “Hublot Big Bang Sapphire Chronograph Unico Limited Edition Usain Bolt Victory Set” will be produced. Eight has been chosen as it represents the number of Olympic medals won by Lightning Bolt. 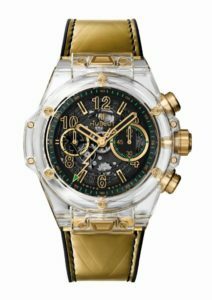 Its 45-mm diameter case is made from polished transparent sapphire, which allows you to appreciate the complexity of its construction. 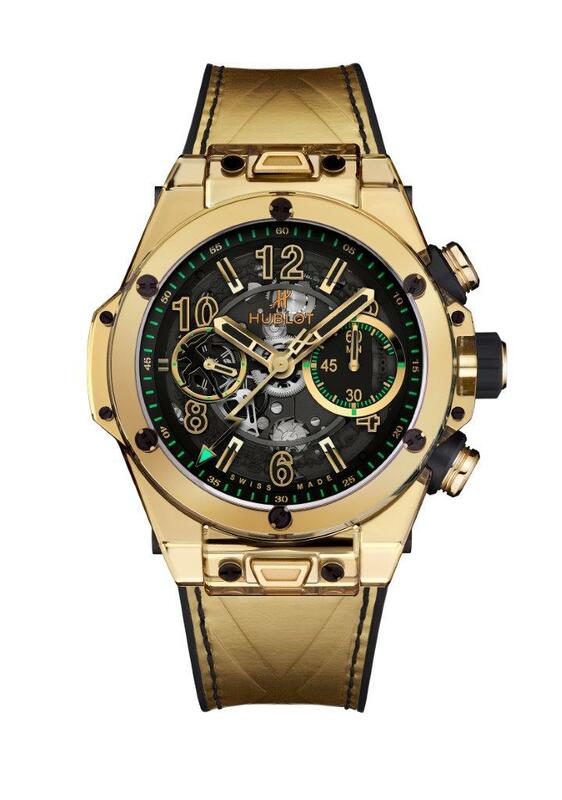 It opens on Hublot’s Unico calibre HUB1242 movement, an automatic chronograph with a power reserve of 72 hours. 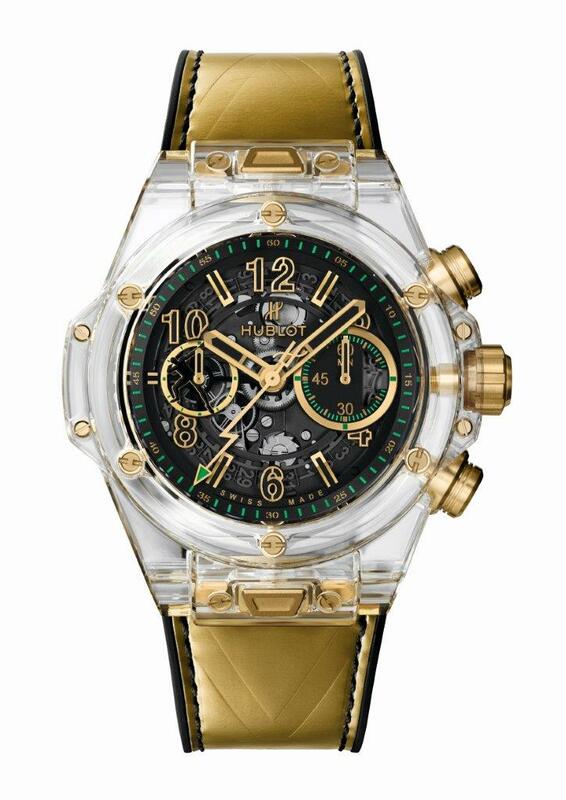 The number of the limited edition is engraved on the sapphire glass back using a highly delicate procedure. 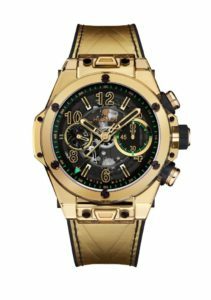 The seconds hand on the black dial with golden markings is shaped like lightning, in reference to Usain Bolt’s nickname. The crown and push buttons are in 18 carat gold—the color of victory. The same hue is carried over to the calf leather strap embossed in homage to the Jamaican flag. The inside of the strap is made from rubber for the wearer’s comfort. It is held by a titanium and yellow gold clasp. 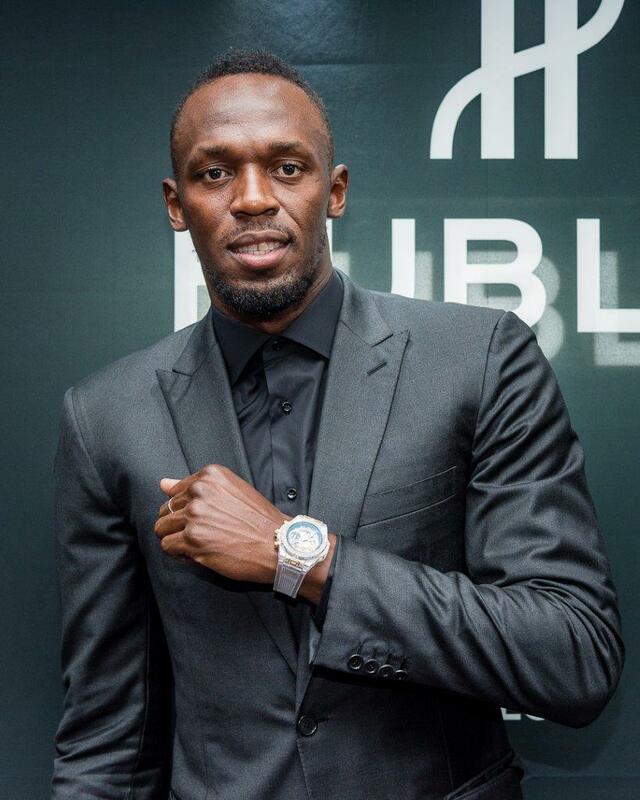 Each of these eight watches shall be delivered in a box including a pair of Puma Gold sprinting spikes, the same shoes worn by Usain Bolt during his final Olympic Games in 2016, and personally signed by the great champion.